app icon jumping in dock. Thats it. where to find it? actually its only the app and it never started at all. Nobody has solved this to my knowledge. Unless I’m wrong, you’ll have to wait for Rack 1.0. Hope this will be really soon. Umm… Check the log in /Documents/Rack? Even build it from source? and, no. just downloaded the last dmg version from the website. What’s strange, usually Rack starts exactly after the bridge server has started, and this is a rare problem. I don’t know, you can try build VCV from sources and see how it works for you– this is relatively easy even if you don’t know how to do it. Also you can build 1.0 version to play with it, but it has only Fundamental modules for now. Hi. 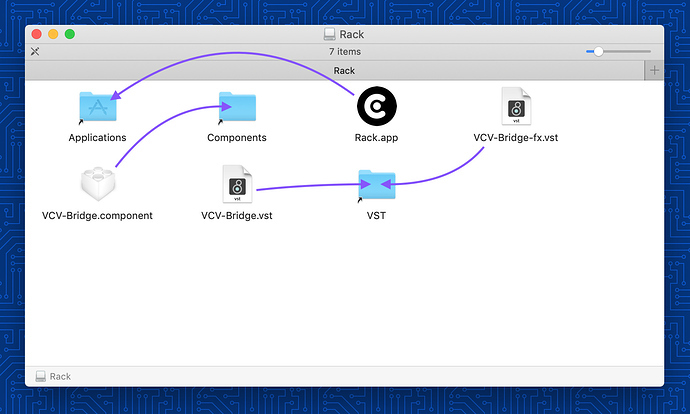 Apologies if you did this already, but when you installed Rack did you copy the VCV-Bridge VST files to the VST folder? See the attached screen shot. Have you try to move the .app on the desktop and right click/open ? Anyone kind enough to help? That’s interesting. Could you launch Rack in a debugger (lldb or gdb from Homebrew), hit Ctrl-Z in the terminal when it hangs, and inspect the threads with info threads and frames with frame? What debugger are you using? Could you send a screenshot of the Audio and MIDI devices in the “Audio MIDI Setup” app in the /Applications/Utilities folder? I suspect a particular audio or MIDI driver is preventing Rack from opening on MacOS. I reallized that any empty folder in plugins solves this problem - maybe not too elegant way, but always You’ll get a something like this message: “Could not load plugin /Users/id/Documents/Rack/plugins/empty_folder_name. See log for details.”. Confirm OK button and voilà. Some inconvenience is the necessity to force exit from the application. BTW, for about two weeks I have this problem on 3 different Mac machines. I don’t see that this has been mentioned, but for anyone that is having the issue, where are you running Rack from? Due to the security changes in Mac OS, if you try running certain applications from a location other than the Applications folder they will not run. For some apps, there is no error message, just the icon bouncing in the dock then nothing.